The opening of the exhibition on 2 February 2007 was successful in every respect. Sokari Douglas Camp, Godfried Donkor, Owusu-Ankomah and Zinkpé were our guests for the great pleasure of the collectors and art lovers present. 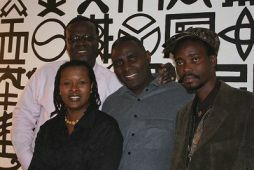 The photo shows the "Stars of the Evening" in front of the large-format canvas "MOVEMENT 32" by Owusu-Ankomah. On three levels and in six exhibition rooms, more than 60 selected exhibits by these internationally successful and important representatives of the contemporary art scene in Africa can be seen. AFRICA SELECT I is the first part of an exhibition series in which current trends in African contemporary art are presented and different artistic positions presented and juxtaposed. In addition to already internationally established artists, we also introduce young and not yet well-known painters, sculptors and object artists within this series.